It will automatically ask to update if you are connected to the Internet if I have published an updated version. Edited by Electric Adventures, Mon Apr 15, 2019 7:22 AM. 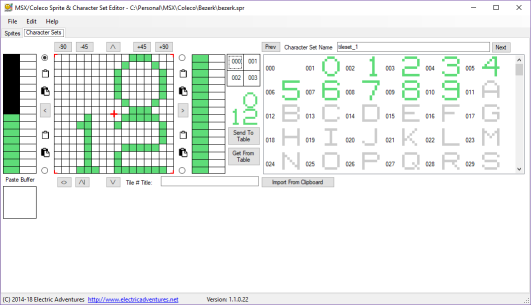 I have released a new version that now includes a tile layout i.e. 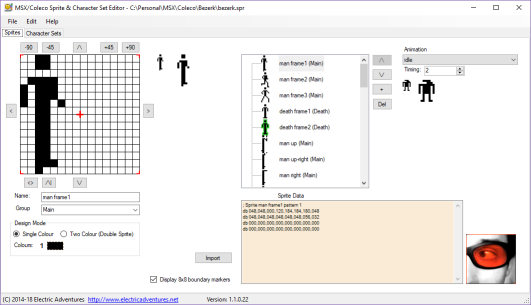 screen editor. Layouts can be output in raw data i.e. 768 bytes or compressed using Pletta. At the moment it assumes the same tileset is used for all three quadrants, and few more controls on the tab need fleshing out, but it is functional. There is a bug in the tileset editor screen with colours, doesn't happen all the time looking into it though. I have also updated my site to have a SSL certificate, which will prepare it for the coming July deadline (and has already cropped up for some scanner tools, warning when sites don't have a SSL certificate). Most results are ASM only. It would be great if it supports RLE compression as well. I use C, not ASM. Edited by Serguei2, Mon Apr 15, 2019 9:24 AM. It's best if the outputs are uncompressed. You can then use the compressor of choice. There were some other previous tile editors that didn't offer uncompressed. Edited by digress, Tue Apr 16, 2019 7:33 AM. You can change how the generated code is output using the options i.e. can be output in a way acceptable to pretty much any compiler/assembler will accept, including C.
RLE is very similar to Pletter I will add a RLE option soon. Output can be in uncompressed or compressed (only by Pletter at the moment), controlled through the options. Compressed data makes more rooms for other stuff. I would be happy for it.